Tonight begins Rosh Hashanah, the Jewish New Year. The year, beginning at sunset, will be 5774. Rosh Hashanah begins a month filled with Jewish holidays, the High Holidays. Following Rosh Hashanah, we have Yom Kippur, Sukkot, Shemini Atzeret, and Simchat Torah. You can read more about each by searching the blog category of Jewish Holidays, as they have been written about in the past. It is also the beginning of the “genealogical year”, as the annual IAJGS conference has recently ended, work really begins on the next conference (ours! ), and we follow this month with the month of Cheshvan, designated as International Jewish Genealogy Month. So this is wishing our UJGS members and friends, and their families, a happy and healthy new year. As we come to the end of the High Holidays, we have two days left. Of course, as you might expect, in Israel, both of these days are celebrated on a single day. Shemini Atzeret means the Assembly of the Eighth [Day]. It occurs the day after the seventh day of Sukkot. While its name might imply that it is part of Sukkot, it is a separate holiday. However, because of the tradition of adding a day to many observances outside of Israel, it can be thought of as coinciding with the last day of Sukkot. Certain practices of Sukkot are not carried over for Shemini Atzeret, like sleeping in the Sukkah and saying the prayer with the lulav and etrog. Rabbinic tradition tells us that Shemini Atzeret is when the world is judged for rainfall, which is of special concern in Israel, and we recite prayers for rain on the day. It is also understood as a day highlighting the relationship between the Jewish people and G-d.
Simchat Torah is a celebration of the Torah. Each year, the Torah (the five books of Moses) is read in the synagogue in portions. On Simchat Torah, the last portion is read immediately followed by the very beginning of Genesis. As many people as possible are called for an aliyah, to recite a blessing for the Torah reading. It is a joyous celebration accompanied by dancing and singing when the ark is opened and the Torahs are revealed and marched around the synagogue. In reformed synagogues, the Torah portions are often divided up so the entire Torah is read every three years. Nevertheless, the holiday is also celebrated each year. Both holidays begin at sundown and last until nightfall of the next day, Shemini Atzeret on October 7th and Simchat Torah on October 8th. More information about some of the practices of these holidays can be read online at our sources of Judaism 101, Wikipedia (and Wikipedia), and Hillel.org. Yom Kippur, the Day of Atonement, is the holiest day of the year for the Jewish people. This year it begins on Tuesday night, September 25th, and ends at nightfall on the 26th. Many Jews will spend most of Yom Kippur at the synagogue in prayer, which begins with the traditional Kol Nidre and ends in a final sounding of the shofar. The observance includes fasting from before sundown until nightfall, for 25 hours. Even drinking water is not allowed. Other practices include not bathing, not wearing leather, not using perfumes or lotions, and no marital relations. It is customary to wear white, which symbolizes purity. It is important to note that, while Jews pray for forgiveness on Yom Kippur, they can only pray for forgiveness for sins against G-d. Atonement for sins against other people must be sought from those people. Yom Kippur is preceded by a festive meal the afternoon before the fast begins and followed by another meal, the break fast. In Israel, there are no radio or TV broadcasts, airports and public transportation shut down, and businesses are closed. For anyone observing Yom Kippur, UJGS wishes you an easy fast. Sunday night begins Rosh Hashanah, the Jewish New Year. L’Shana Tovah! (For a good year!) Chag Samech! (Happy Holiday!) It’s the beginning of 5773. Rosh Hashanah occurs on the first of Tishrei. As usual with Jewish holidays, it begins at sunset. It is celebrated for two days everywhere. An earlier article here mentioned why we often celebrate holidays for one day in Israel and two in the Diaspora. Because the Sanhedrin had to declare the new month by the moon phases, and as our ancestors spread out from Israel, it was too distant to get the message out fast enough, so they often observed holidays for two days to be sure they got it right for one of them. For Rosh Hashanah, messengers were not dispatched even in Israel, thus they also celebrate for two days. Much of the holiday is spent at the synagogue, where we listen to the blowing of the shofar. There are 100 notes sounded each day in specific patterns. Another tradition is to have apples dipped in honey, signifying our wish for a sweet new year. Challah is usually baked in a round shape, instead of the usual braid. Many people also dip the challah in honey. Rosh Hashanah is the beginning of the High Holidays, a series of holidays that extend for almost a month. You can read more about the holiday at Judaism 101, the source for most of this article, or on Wikipedia. Tomorrow evening at sunset, May 26th, begins the holiday of Shavuot. Beginning on the second night of Passover, we begin the Counting of the Omer, which leads us to Shavuot 49 days later. Shavuot translates to the Festival of Weeks, in part because of the counting of seven weeks leading up to the holiday. In Israel, Shavuot is celebrated for one day, while it is celebrated for two in the Diaspora (except for Reform Jews, who celebrate one day). Why is this? Because before the Jewish calendar was fixed by mathematical calculation in 358 CE, new months were determined by witness testimony to the new moon and declared by the Sanhedrin (the ancient Jewish courts). As the diaspora spread, communities became too distant to hear when the new month had been declared. Therefore, a second day was added to insure that they did not risk violating the holiday. The second day remains a celebration to honor the practice. Shavuot is celebrated with the consumption of dairy products, reading the Book of Ruth, decorating with greenery, and all night Torah study. Salt Lake County’s two major synagogues are offering “all night” Torah study and Shavuot celebrations. More information can be found on their web sites. Congregation Kol Ami and the Melton School are offering Torah study and a dairy buffet on May 26th (some details on the calendar or page 15 of the newsletter). Bais Menachem (Chabad Lubavitch of Utah) is having Torah study on the 26th, and on the 27th, a reading of the Ten Commandments followed by a Cheesecake and Ice Cream Party. Information from this article was found on Wikipedia, Judaism 101, and Jewish Treats, as well as the synagogue links above. April 19th is Yom HaShoah. As with most Jewish holidays, it begins at sundown the evening before. Yom HaShoah is a new holiday, designated by the Knesset (Israeli Parliament) in 1953, commemorating the victims of the Holocaust. The full name is Yom HaShoah veHagevurah, the Day of Remembrance of the Holocaust and the Heroism. It occurs each year on the 27th of Nisan, except when adjacent to Shabbat, when it moves one day. In Israel, a ceremony is held at Yad Vashem at sundown. Flags are flown at half mast. The entire day is very solemn. In the morning, sirens are sounded throughout Israel for two minutes when the entire country stops to pay silent tribute. Even on highways, drivers stop their cars and wait in silence. Public entertainment venues are closed by law. Many Orthodox do not commemorate this date, instead using the 10th of Tevet or Tisha b’Av for remembrance. Outside of Israel, commemorations range from synagogue services to community vigils and educational programs. Rituals are still being created and vary widely but usually include the lighting of a Yahrzeit (memorial) candle and recitation of the Mourner’s Kaddish. In 1980, the US Congress designated an eight day period of The Days of Remembrance of the Victims of the Holocaust (DRVH), beginning the Sunday before Yom HaShoah and continuing until the following Sunday. The US Holocaust Memorial Museum designates a theme for each year’s programs. For 2012, the theme is Choosing to Act: Stories of Rescue, and DRVH is from April 15-22. In 2005, the United Nations also designated an International Holocaust Remembrance Day for the 27th of January. Most of this information and more can be found at some of the following web sites: Wikipedia, Jewish Virtual Library, and the US Holocaust Memorial Museum. Friday night begins the holiday of Passover, or Pesach in Hebrew. Passover lasts for eight days, but like most Jewish holidays, it begin at sundown. No work is permitted on the first two days and the last two days of the holiday. Passover commemorates the Exodus of Jews from Egypt. The first two nights involve the Seder, a family meal filled with rituals and the reading of the Haggadah. The Haggadah tells the story of the Exodus from Egypt and explains some of the practices and symbols of the holiday. As with some other holidays, the observances in Israel differ from the rest of the world. In Israel, Passover only lasts for seven days, the Seder is only on the first night, and work is not permitted on the first and last days. A significant observance of Passover involves avoiding Chametz, which is any leavened food, commemorating when the Jews left Egypt in a hurry and did not have time to let their bread rise. Chametz includes anything made from the five major grains of wheat, rye, barley, oat, and spelt. Ashkenazi Jews will also avoid rice, corn, peanuts, and legumes. Not only can Chametz not be eaten, it must not be owned or even fed to pets or other animals. Before Passover, Jews will dispose of their Chametz by cleaning the entire house of it. A formal search for Chametz will occur before the first Seder where any remaining Chametz is burned. One such tradition is to place pieces of bread to be found, which are then swept up with a feather, to ceremoniously finish cleaning the house. Depending on their level of observance, some Jews will cover all kitchen surfaces and kasher all of their kitchen items, or have an entirely separate set of dishes, utensils, pots, and pans just for the holiday. 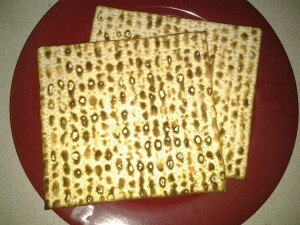 Since bread is not allowed, Jews will each Matzah, unleavened bread, made simply from flour and water and cooked very quickly. Some of the information in this article was found at Judaism 101, where more details about the holiday can be found. For those interested, About.com has a list of Haggadahs (Haggadot in Hebrew) that are online and can be downloaded free. Tonight is Purim. Happy Purim from UJGS! What is Purim? It is the Jewish holiday that celebrates the story told in the Book of Esther. In Shushan, Persia, Esther was raised by her cousin, Mordechai. King Ahasuerus, after dismissing his wife, went looking for a new wife, choosing Esther, without realizing she was Jewish. The villain of the story is Haman, the king’s advisor, who plotted to kill all of the Jewish people when Mordechai refused to bow down to him. Esther fasted for three days then approached the king, finally telling him that she was Jewish, and asked him to save the lives of her people. She prevailed and Haman was hanged on the gallows that he had prepared by him for Mordechai. Purim is celebrated on the 14th of Adar, except in Jerusalem and other cities that were walled during the time of Joshua, where it is celebrated on the 15th. In a leap year, it occurs during Adar II, the leap month. Purim is a festive holiday which includes dressing up in costumes, eating Hamentashen, and listening to a reading of the Megillah (the Book of Esther). More details about the holiday can be found at Judaism 101.